There is a reason why a lot of people pay for coffee-styled drinks like cappuccinos, lattes and others at local coffee shops. These drinks combine steamed milk with quality espresso. 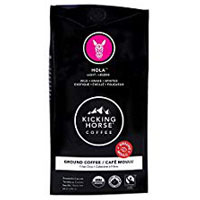 At first thought, you would think that these drinks are just coffee, but in reality, they more labor-intensive than standard cups of drip coffee. If you want to learn how to do this tricky process and enjoy tasty results at home, you can study it for hours and hours. But there’s an easier option. 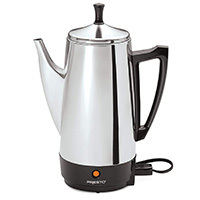 Just get an espresso maker, particularly the Mr. Coffee Cafe Barista espresso maker. Not only will you save time, but it will also save you money in the long run. Because of spending much more in coffee shops, you can just make it at home. Here’s why the Mr Coffee Cafe Barista is a good option. Before you can start enjoying different espresso drinks, you need to prime this unit. Don’t worry, this process may sound a bit complex to some consumers, but you will be able to follow it easily because it’s described quite clearly in the manual. All you have to do is fill up its water and milk tanks with enough water to run a few different cycles. 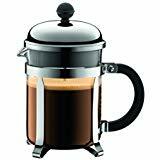 The Mr Coffee Cafe Barista espresso maker also includes extra accessories like a milk reservoir, portable filter, water tank with a special lid, filters for single and double shots, measuring tamper and book with tasty espresso recipes. 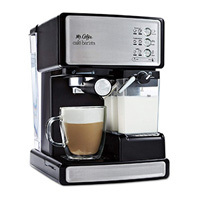 In terms of technology, the Mr. Coffee Barista espresso maker will cover all the basics of a super automatic coffee maker. And at the heart of the machine, there is a single pump boiler that is responsible for extracting the espresso and frothing the milk. That means you’ll have to alternate between the two modes to finish your coffee. The boiler is powerful enough to produce your morning coffee. Just make sure you don’t use it for high volumes as it won’t keep up with the pace. It’s an entry level espresso machine after all. Each side is surrounded by a green LED light that flashes or lights up based on a specific cycle or step. Plus, you will see small icons with LED lights that light up for every button pressed. This makes it easier for the user to choose their preferred espresso choices. The milk and water reservoirs also have clear visible lines for maximum fill level. Lastly, the Mr. Coffee Barista espresso maker uses dishwasher-safe parts. The user can wash almost all machine elements in their dishwashers. This makes it very convenient because this feature is a time saver. If you look at the prices of coffee makers, there is dramatic price fluctuation from $150 machines to $2000+ coffee monsters. 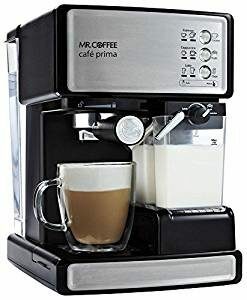 The Mr. Coffee Barista espresso maker occupies the space of the entry level coffee maker and is most suited for people who love to drink frothy cappuccinos and are looking to buy their first coffee machine. This espresso maker does what it advertises and more. Plus, it isn’t expensive so it won’t be a huge investment. So overall, it is a good buy.